Richard Duffee speaks in dozens of distinct voices, mingling satire, conundrum, fable, and theater to depict the struggle of individual humans to get by. Having spent much of his life among people with little but spirit, Duffee knows need, and his observations are vivid and passionate. Duffee expands our otherwise myopic American vision to include the whole world. In The Slow News of Need human voices and irrepressible intelligence(s) cry into the thin air of contemporary life, demanding to be heard, to be known. This is an important book. Richard Duffee gives us great insight into how power works in the minds of the powerful and on the minds of the powerless. This is the poetry of moral economics, endlessly numerative and enormously sad. More than any other poet I know, Duffee’s work (of all kinds) and life occupy a brightly lit, highly conscious moral space. The things and people he cares about number in the millions, but do not, for the most part, include himself. You have to spend time around poets to realize how utterly strange this is. It’s always been true, and he’s always been the best, and the most genuine I know. 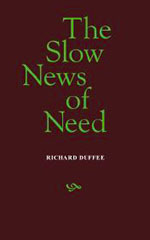 The Slow News of Need, started in 1966, got its present design in 2001. Since then Richard Duffee has been assembling it piece by piece, as if it were a jigsaw puzzle. Born in 1948, Richard Duffee lived fifteen years outside Philadelphia, ten mostly in Chicago, twenty in the Hudson Valley, then nine in South Asia, where he married into an Indian family. As a child immersed in biology, in adolescence he turned to philosophy and literature, then, at 38, to law, especially international and environmental law. He has worked as a busboy, a painter, a bookseller, a psychiatric aide, a plumber, an editor, a photographer, a teacher of English, science, and history, an advocate for the homeless, a lawyer, and, in India, as a grant writer and law professor. Long active in protest and politics, he is the 2008 Green Party nominee for Congress in the 4th district of Connecticut and writes and speaks on the ethics of the relations between the rich and poor countries, global warming, and law.